“You feel alone with people too,” says the snake. “I can take you very far,” the snake says. “Oh! I understand,” says the little prince. The little prince says goodbye to the snake. Then he is walking in the desert. He meets a flower. “Good morning,” says the little prince. “Good morning,” says the flower. 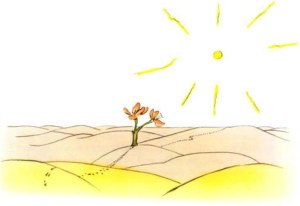 “Where are the people?” the little prince asks. “People?” I believe that six or seven people live on Earth. I see them sometimes in a caravan. But you never know where they are. The life is very difficult for them because they don’t have any roots. The wind takes them away. “Goodbye,” says the little prince. 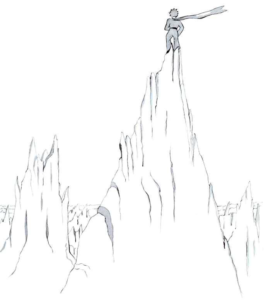 The little prince sees a high mountain. The only mountains which he knows are the three volcanoes which are as high as his knees. He goes to the top of the mountain. But he only sees other mountains around. “Hello, hello, hello,” the echo answers. “Who are you?” asks the little prince. “Who are you? Who are you? Who are you?” the echo answers. “Let’s be friends, I am alone,” he says. “I am alone, I am alone, I am alone,” the echo answers. 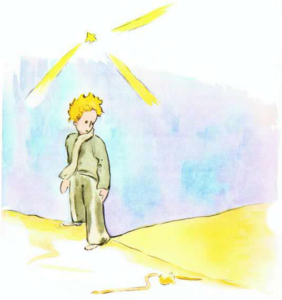 The little prince is walking for a long time through sand and rocks. Then he finally sees a road. And all roads go to people. “Good morning,” says the little prince. He is standing before a garden full of roses. “Good morning,” say the roses. 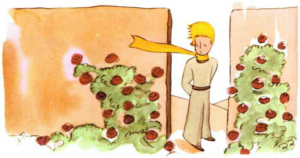 The little prince is looking at the roses. They all look like his flower. He is surprised. “We are roses,” the roses say. “Ah!” says the little prince. And he is very unhappy. His flower says that she is the only flower of her kind in the whole universe. And here are five thousand roses, all the same, in one garden! And, he is lying in the grass and he is very sad.